With our family holiday dinner behind me and some packing ahead, I am keen on finishing up the last few days of The Gift Wrap Extravaganza so I will double post on a few of the days. So much gift wrapping talent! And as the posts were published it seemed to me a good time to sort them all together so at any time you could easily back reference all this gift wrapping talent and inspiration at any time of year. I will add this gift wrap category of talent from everywhere to my header before I leave this week. I have added a few more to some of the categories as I find them so be sure to take a peek. This brings me to one of my favorite categories which was the most unusual, what I refer to as the "moderns". As much as I love ribbon, there is something to be said for materials and method of a more modern nature in gift wrapping styles. 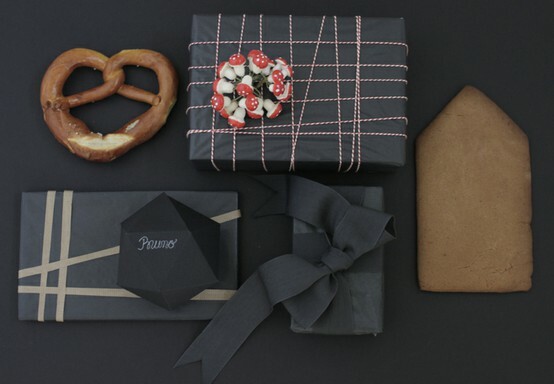 The "Moderns" clearly demonstrate that a novel approach and artistic interpetation make for a unique and thoughful gift presentation. 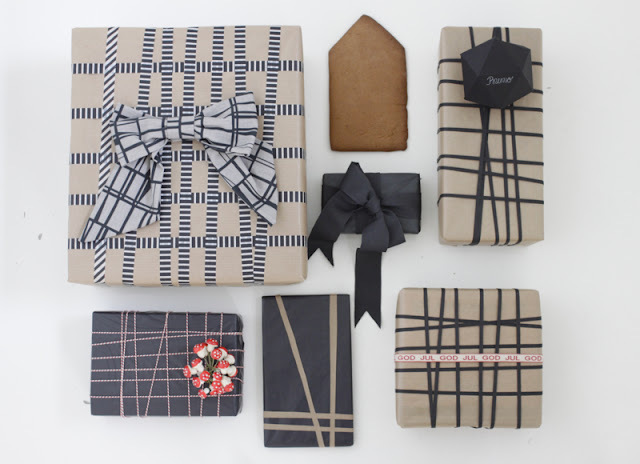 I was more than intrigued with this modern approach to gift wrapping from the Finland based stylist and blogger Age of the Aquarius. The creative execution with tape and string grid patterns in the three photos above shows that holiday wrapping can be simple and sophisticated. Something's Hiding In Here took a collection of vintage portrait paintings and had 11" x 17' colour copies made for a brilliant gift wrap solution. 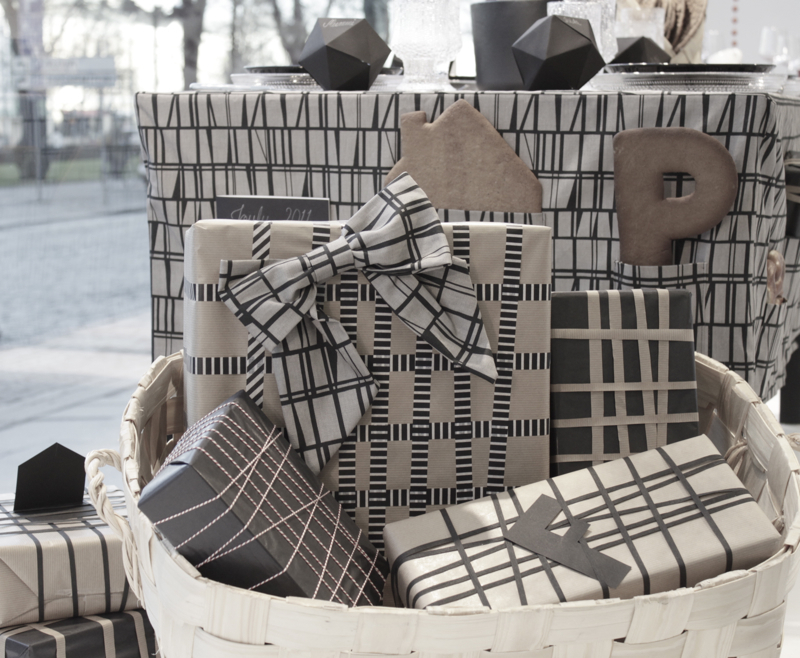 Ties with simple twine, this highly visual idea was one of the blogger finalists in The Martha Stewart Gift Wrap Challenge. 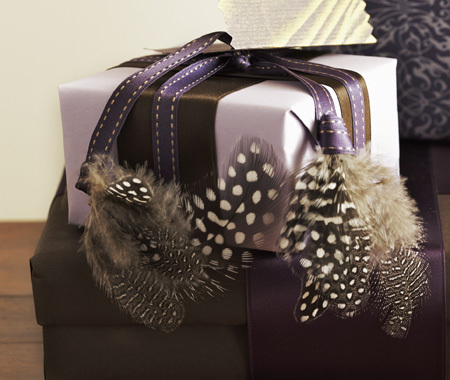 I love these - the feathers are a fantastic addition. 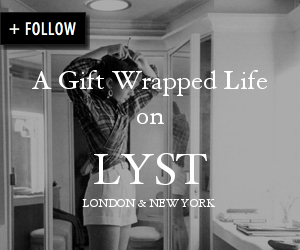 I did a post on presents recently and featured some of your ideas! Thanks for the inspiration! 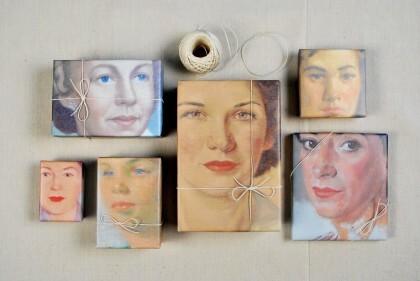 The gift wrap from vintage portrait paintings is brilliant. My question would be, "Can what is inside the box possibly measure up to the outside?" Have a lovely holiday. Sande these are all so unique. I have a few more gifts to wrap so I know others do too, I bet they will love all of your great post as much as I do. This takes gift wrapping to a whole new level...being a lover of gift wrap, I really appreciate this! I'm so very excited to have found your blog! Your ideas are incredibly creative and lovely! absolutely adore the clay tags! what a fun idea to gather such wrappiing genius to add to your brilliance! happy christmas to you lovely sande! Wow love the Nordic take; filing in the banks....LOVE! Oh, my...that dark charcoal paper layered with the dark charcoal ribbon is gorgeous!